Home Entertainment Lea Michele's Mom Threw Her the Bridal Shower of Her Dreams! Lea Michele's Mom Threw Her the Bridal Shower of Her Dreams! Lea Michele is getting married soon and her mom Edith threw her the bridal shower of her dreams this past weekend! The 32-year-old former Glee actress took to her Instagram account to share a bunch of great photos from the event, which was held at ABC Kitchen in New York City. “My mom threw me the bridal shower of my dreams! 💍👰🏻💓,” Lea wrote. 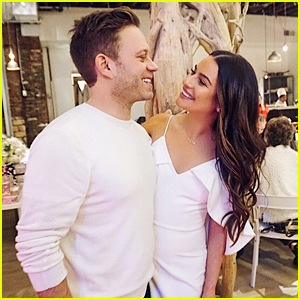 Lea‘s husband-to-be Zandy Reich stopped by the bridal shower and the engaged couple snapped some adorable photos, taken by hair stylist Sarah Potempa. Gift bags for the guests included some of Lea‘s favorite things, including Hanky Panky lace thongs, BaubleBar earrings, a jade roller from Shiffa, and hairspray from the Beachwaver haircare line.